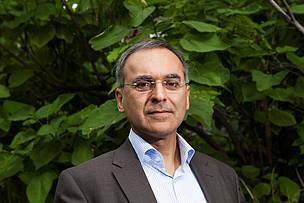 The former head of UNEP’s Green Economy Initiative, Pavan Sukhdev, has been named as the new President of WWF International’s Board. Gland, Switzerland (21 November 2017) – The former head of UNEP’s Green Economy Initiative, Pavan Sukhdev, has been named as the new President of WWF International’s Board. Mr. Sukhdev replaces outgoing President Yolanda Kakabadse who steps down at the end of this year after eight years in the position. The announcement came at WWF International’s Board meeting on Sunday, 19 November 2017. Mr. Sukhdev served as Special Advisor and Head of UNEP’s Green Economy Initiative from 2008 to 2011, working in partnership with numerous international and national bodies to deliver UNEP’s influential report ‘Towards a Green Economy’. “Pavan Sukhdev is a true thought leader in sustainability and a highly influential voice among policy makers. I am delighted that WWF will have such a respected personality as its next President,” said Ms. Kakabadse. Mr. Sukhdev was Study Leader (2008-2011) on the landmark project TEEB (‘The Economics of Ecosystems & Biodiversity’), a global study commissioned by the G8+5 and hosted by UNEP. His work on sustainability and the economics of ecosystems and biodiversity has won him international acclaim, including the prestigious Gothenburg Award for Sustainable Development and the Blue Planet Prize. He is the Founder-CEO of GIST Advisory, a specialist consulting firm which helps governments and corporations discover, measure, value, and manage their impacts on natural and human capital. In recognition of his continuing work in helping governments and corporations transition towards a Green Economy, UNEP appointed Pavan as the UNEP Goodwill Ambassador in the year 2012. He was also selected as the “Personality of the Year” by Environmental Finance in 2010. Marco Lambertini, Director-General of WWF International, said: “I am delighted to welcome Pavan Sukhdev as the next President of WWF International’s Board. Pavan’s passion and knowledge of the interdependence between economic and natural systems connect perfectly with WWF’s higher ambition for impact, at a time when biodiversity and natural resources are under unprecedented pressure, but also at a time when recognition of the crucial role of natural systems to our well-being, social stability and economic development has never been greater. The President may serve up to two consecutive or non-consecutive four-year terms. External candidates, as well as Board members, are eligible to stand for the office of President; however, the terms of office of President may not exceed their terms as Board members. The President also chairs WWF International’s Council, being an advisory body constituted of the Chairs of the Boards of the national entities that constitute the WWF network. Mr. Pavan Sukhdev’s full biography can be consulted here.